This is it. This is the last recipe I found in Dorie's book where leaving out the sugar shouldn't make a big difference. I like almost all kinds of nuts (hazelnuts are not my favourite), so scones with a lot of almond taste are perfect for my last Lenten week. I exchanged the cream for lactose free yoghurt and the whole milk for soy-rice-milk, and it was fine. I took a tad less baking powder, and the scones did not spread a lot - maybe they would have otherwise. As usual, baking time was far less for my oven (about 12 mins for the first, and 10 mins for the second batch). Funnily, I forgot to toast the almond slices. 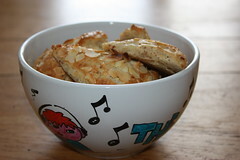 And that's funny, because I did not find out before I was looking up the accurate name of the scones to put it in this blog-entry :o] So, I guess it would have put the almond taste even more forward, but obviously it didn't matter too much. I will definitely, definitely do them again, even if I look at all the recipes I first have to catch up with. But from all the Scones/Biscuit-recipes I made recently (Basic Biscuits, Sweet Potato Biscuits, Apple Cheddar Scones), this is definitely the one I like most and up to now my favourite scones recipe! These scones look equally tempting! 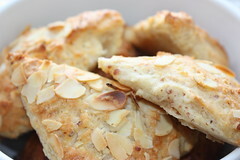 :-) Thanks for sharing; I'd like to give this scone recipe a try one day! Yum, I love scones!!! These look really good!